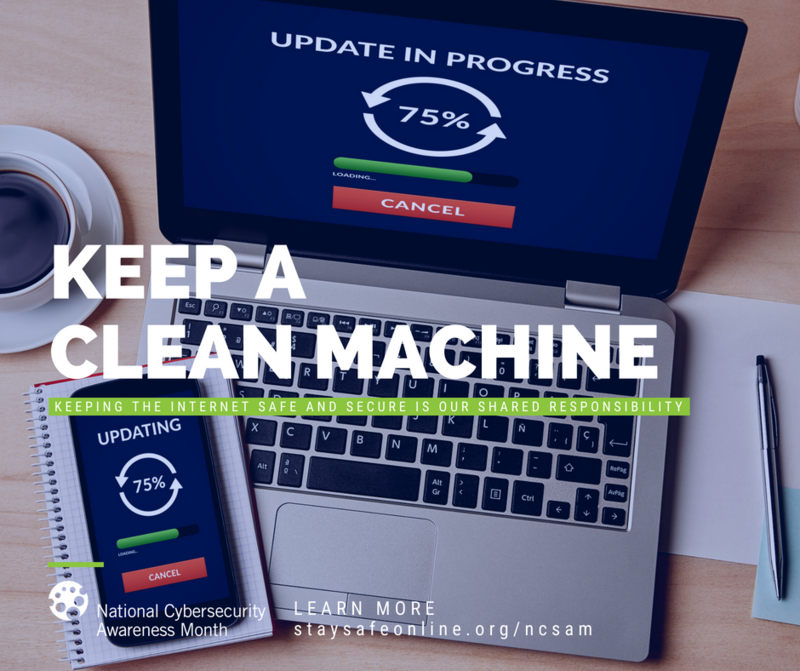 Autumn is here, and that means changing leaves, pumpkin spice, and Cybersecurity Awareness Month! 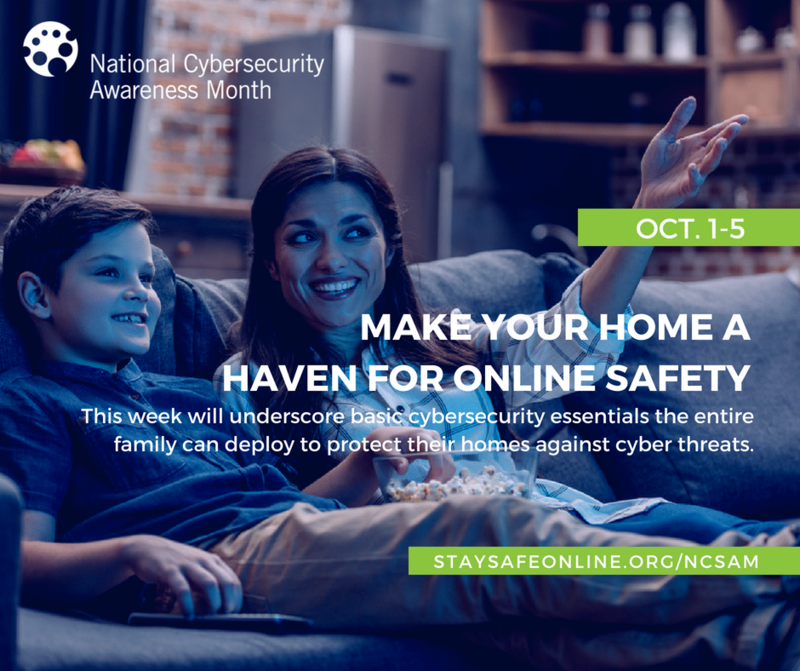 The theme for the first week of Cybersecurity Awareness Month is Make Your Home A Haven for Online Safety. Here are 6 things you can do to protect yourself and your family at home. You already know you need to use strong, unique passwords for your accounts. But even a strong password isn’t enough to protect your key accounts like email, banking, or social media. Add another layer of security by using two-factor authentication – an access control method that requires an additional security step to allow a user to log in. While this can seem inconvenient, it’s less inconvenient than finding your security has been compromised. 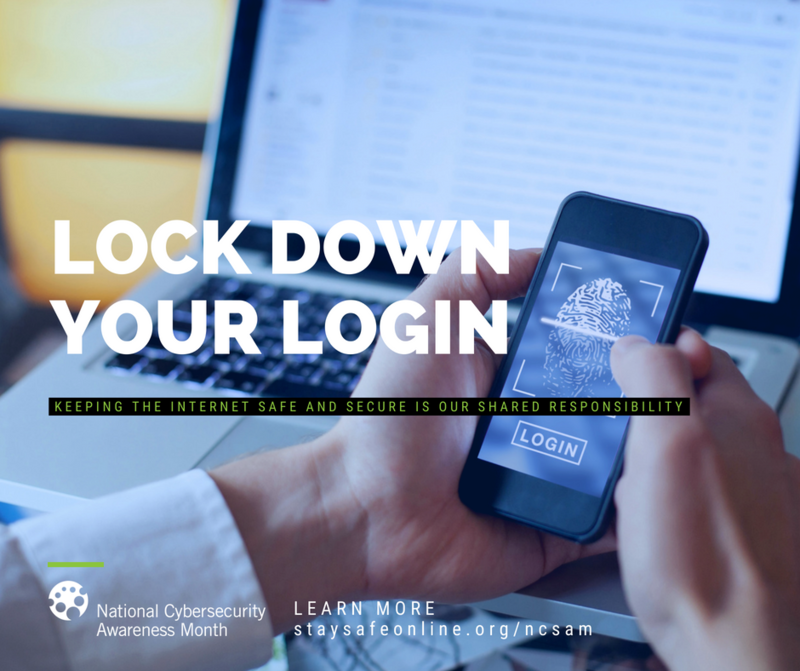 If you use a system that offers two-factor authentication, as many banking, email, and social media websites do, take a few moments to set it up. Pro Tip: Where possible, use an authentication app (such as Authy, Google Authenticator, or a service-specific app) in preference to an SMS message sent to your phone. While the SMS method is better than nothing, SMS is insecure and can be intercepted. Digital devices give us great convenience and connectivity, and we’re more connected than ever before. That convenience comes at a cost, however. You are constantly generating data about yourself and others. These devices work by collecting and processing information about you, such as your behaviors and preferences. Information about you – items you’ve purchased, where you go, and what you do – has value, just like money. It’s not necessarily harmful; for example, sharing information on purchases can help you get better deals from a merchant. However, be mindful about what information you’re sharing. 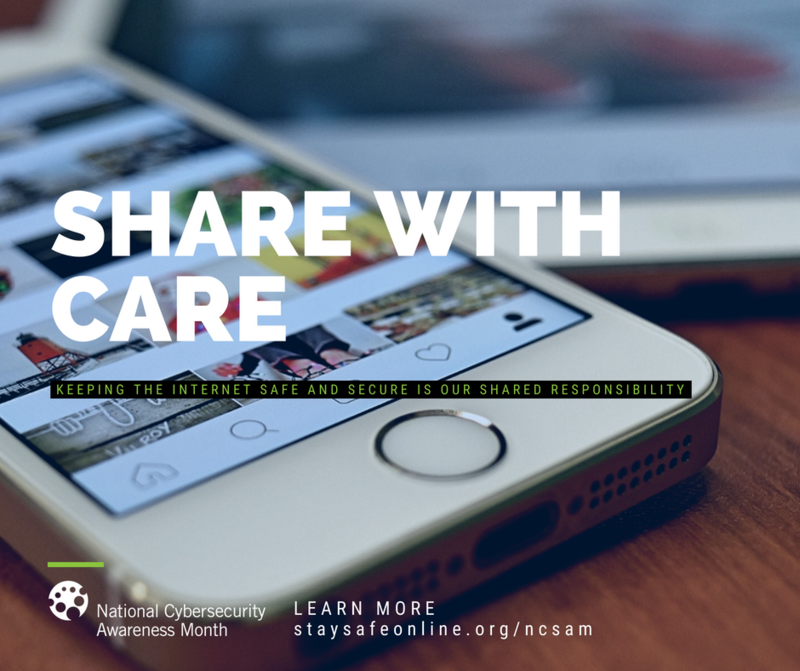 Consider how your information is collected by apps, websites, and connected home devices, and be sure you’re comfortable with the level of sharing. Remember that nothing is private! Remember that nothing is private! Think before you post about yourself and others online. Consider what a post reveals, who might see it, and how it might affect you and others now and in the future. 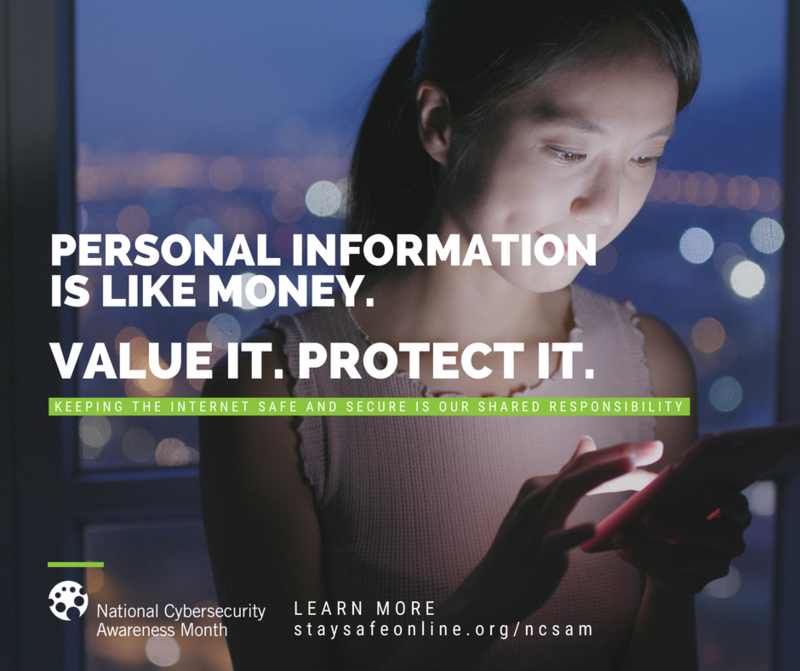 Never post sensitive information such as passwords or account information on social media, and be very careful about sharing personal information such as your phone number or address. Do check your privacy settings, but don’t depend on them to protect your information. Once something is posted online, it’s out of your control, and you don’t know who might see it, share it, or use it. Keep all the software on your computer, smartphone, tablets, and other internet-connected devices current. This is the best way to reduce the risk of malware infecting your device. Often you can set devices to update automatically, but it’s a good idea to check occasionally to make sure you’re running the latest versions. Don’t forget devices like your home router and smart home hubs – they usually have less frequent updates, but may require extra steps and manual updates. Your WiFi router is a gateway into your home network. Remember to secure it the same way you secure your computer and mobile devices. Change the default name and password on your router, and use WPA (WiFi Protected Access) encryption. Use a strong passphrase to secure access, and name your network in a way that won’t let people know it’s in your house. And don’t forget to check for and apply updates. 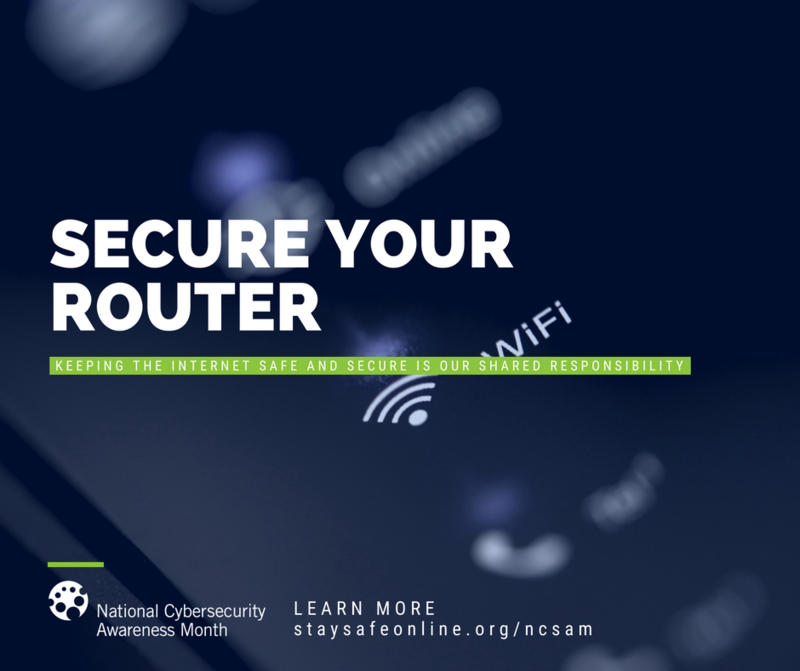 Depending on the router you have, you may be able to block certain websites that you don’t want anyone in your family visiting, or you may be able to monitor traffic to see who’s connected (and if there’s someone who shouldn’t be). Most current routers also have the ability to set up a “guest network” for visitors, so you can let your friends and family access the internet without exposing your personal files. 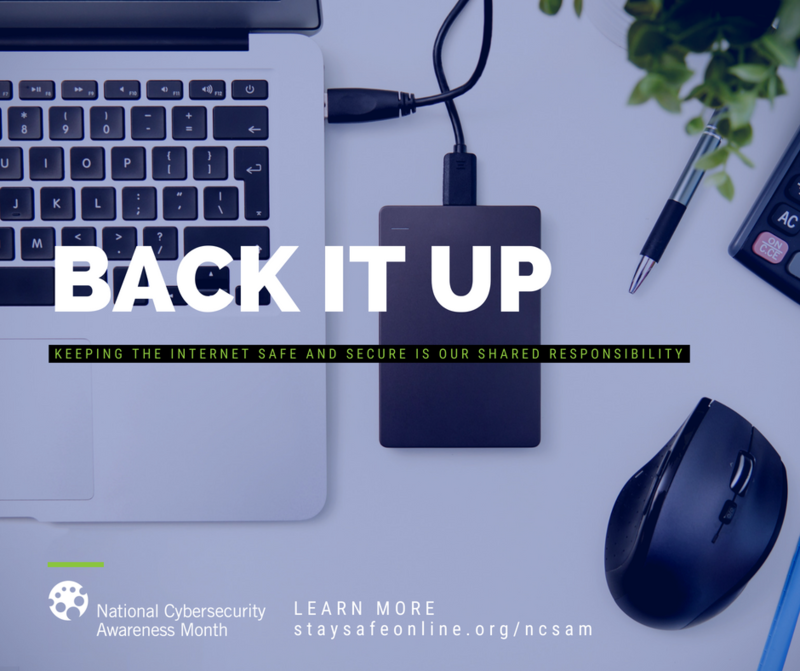 Protect your valuable work, music, photos and other digital information by making electronic copies and storing them safely. If you fall victim to ransomware, the best response is to have all your data safely backed up and available to restore. Learn the Backup Rule of Three and the Three Rules of Backup! Use the “backup rule of three” and don’t forget to test your backups to make sure you can retrieve your important files! Read about the Three Rules of Backup and options to help you back up your business or personal data.